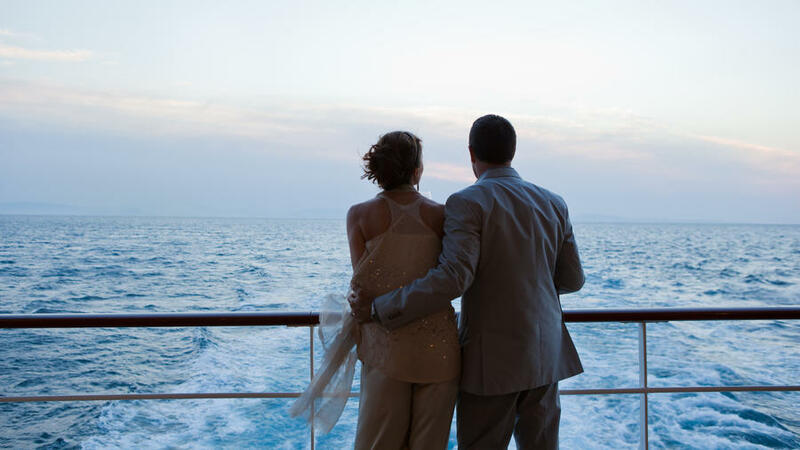 Nothing stokes our fire more than the words “all-inclusive,” especially on a Regent cruise to Alaska, because it means everything—from the shore excursions to the WiFi—is already included in your rate. This cruise in particular floats our (ahem) Seven Seas Mariner boat, thanks to misty fjord tours, rainforest canoeing, and bear sightings by floatplane. 7 nights from $4,999, roundtrip from Vancouver, B.C. The company that’s reviving luxury steamboat travel down south is also exuding Southern charm on the Columbia River aboard the American Empress, with plenty of included shore excursions (you’ll want to stop by Sunshine Mills Winery) and locavore fare onboard, including smoked salmon and Dungeness crab—all tailor-made for couples on the lam. 9 days from $2,649 per guest, roundtrip from Portland, OR. You’ll feel like you own a private yacht aboard the Wind Surf, with its seven billowing sails and an Egyptian cotton-swathed bed in your cabin. Activities are invigorating even for long-married couples: swim with dolphins in a protected lagoon, snorkel around uninhabited Norman Island, and swim under a waterfall at Ti Tou Gorge, a setting for Pirates of the Caribbean 2. 9-day cruise from $1,379 per person round trip, from Philipsburg, St. Maarten. When you don’t have time to go far, sometimes all you need is a quick half-hour cruise: holding hands on an open-air deck of Salish or Kennewick ships, wind in your hair, the occasional orca gliding by in the waters beneath you. Make a proper date of it by stopping by Port Townsend’s for organic apple cinnamon scones, straight from the oven. 35 minutes from $3.30 per person, from Port Townsend to Keystone. If a long weekend away is all you need to revive the flame, hop on the Ruby Princess for 24-hour room service, movies under the stars, and the chance to sip chenin blanc at the circa 1888 Bodegas de Santo Tomas winery in Baja. Did we mention the ship was christened by Trista and Ryan Sutter, one of the only couples from The Bachelorette to “make it?” We’d give it our final rose. 4-day cruise from $299 per person, roundtrip from Los Angeles. Whitewashed ports, shimmering turquoise seas, and sunkissed skin—what’s a bigger aphrodisiac than the home of Aphrodite? Exploring Greek isles is even better aboard the 112-guest SeaDream II yacht, where the only thing you’ll love more than seeing Santorini and Patmos is after dinner cocktails under the stars at the Top of the Yacht bar. 7-day cruise from $4,499 per person, roundtrip from Athens. Bora Bora is a picture-perfect screensaver brought to life, and it’s yours to gawk at together, whether you choose to pick up your jaws from a powdery white sand beach or blue lagoon paddleboard. The simplest staterooms have portholes and private bathtubs, too, so even if you skimp on your cabin, you won’t skimp on romance. 7-night cruise from $5,545, including round-trip airfare from Los Angeles.